The bitterly ironic part is that when these folks hit the streets in mass protests, it will likely be for more of the same that put them there in the first place. An apparent paradox that frequently puzzles journalists is that Europeans work fewer hours than workers in the United States, while in some countries, hourly productivity appears to be the same, or even higher, than that of American workers. This is not actually a paradox at all. Much of the decline in European hours worked per-capita came in the form of unemployment. Rigid labor laws which make it hard to fire (and thus, risky to hire) shut less productive workers out of the market, particularly the young, and those who had been displaced due to disruptive industry change. So does anything that raises the cost of labor, like, er, loads of mandatory vacation and leave. When you exclude your least productive workers from the labor force, your measured hourly productivity will be higher, particularly if you use metrics like GDP per hours worked. There is something else going on here as well that I think is uniquely American. That is two sides of the same coin, i.e. young woman who get pregnant and have children are provided welfare which include everything they need o why would they work. Conversely young men who become fathers are pursued by the same government that provides all the freebies to the unwed mothers to pay "child support". The young men generally have no marketable skills and could not possibly survive in a minimum wage job after payroll taxes and child support are deducted so they choose not to work. They are in a trap with no way out unless they could earn in excess of about $40k. I'm sure someone will respond that they should pay child support to which I respond of course they should. Shouldn't both parents? Why does one parent (always the woman) win the lottery when she has a child outside of marriage while the other parent (always the man) become a victim of an almost retaliatory sexist government legal system. Why wouldn't the system be "blind" and award joint custody, joint responsibility and equal punishment for failure to meet that standard? This whole minimum wage/child labor laws thing has been a sore spot with me for decades. I am 83 years old. When I was 13, I got my first job as a produce boy in a Kroger store. I worked two hours per day after school. I was paid 35c per hour. It cost two 6c street car tickets to go to and from work. Thus I netted out 58c for about three hours work plus travel time. In my early youth, I delivered papers (about $4 per week), caddied ($1.60 for 18 holes double, carryng two bags for four hours), set pins in a bowling alley, etc. I mowed lawns (50c for a whole yard with a hand mower). Before I did any of this, I was envious of an older friend who delivered prescriptions for the corner pharmacy on his bike for 15c per hour. By the time I was 18, I had many years of valuable work experience. In university, I had a part time job at the university research lab at 90c per hour and thought I was rich. Now, with child labor laws and minimum wage, none of this is possible. Consequently, many young people have no idea how to deal with a boss, how to do good solid work, how to deal with customers, etc. until they are out of high school. In many cases, they don't get a job until out of college. They have no experience in manageing their income. Our efforts to avoid child exploitation, sweat shops, etc. have resulted in far more harm than good. Nobody hires a teenager to mow the lawn as it is too expensive and you are liable if the kid gets hurt. A babysitter, who cost 50c per hour 60 years ago, is now priced out of work. Any kind of domestic help gets you swamped with IRS crap. Have we made a mess of all this or what? If you hang enough cost, regs, IRS forms, liability, and hassle on something, you will shut it down. The idiots in Washington (and certainly in Europe) are merely demonstrating what any of us old farts could have told them decades ago. They are to be congratulated for ruining the lives of the younger generation with their policies. Low paying entry level jobs, which were the first step up the ladder, are gone. In my day, every kid could get a $35c per hour or similar job. No more. It's against the law and the employer is swamped with regs and liabilities. I hate to harp on the good old days, but the old adage "if it ain't broke, don't fix it" seems truer than ever. Is a kid better off with a low paying entry level job or loafing and smoking pot and reaching 18 with little or no work experience? There is of course the other side of the coin. The USG not only makes it impossible for young people to find work at wages someone is willing to pay, but they then turn around and reward indolece and irresponsible behavior. I read somewhere that an unemployed woman with two out-of-wedlock children, receiving all the availble government help, has the living standard of someone earning $32,000 per year. We now have a system where people are encouraged to do irresponsible things, and getting started on the job ladder is discouraged. Are we collectively nuts or what? Well, to be fair, if you do all the above things, you also get the powerhouse that is the German economy. My take is that it all depends on the implementation (ie one of the things that strike me is that beaurocracy in Italy/Spain but as well in the US is more about someone having insane power over my decisions but is unavailable/unsympathetic/unable to listen to my concerns and make a decision whereas in Germany, the first thing public servants appear to do is to listen carefully, understand the problem and then do the utmost to help out within the confines of the law as they can). My point is more that the Us approach of "you pay a lot of taxes and have a lot of stupid labor laws but get nothing in return" isn't really preferable to the European one of "you pay a lot of taxes and have a lot of stupid labor laws but get pretty decent social safety in return". I'd just love to see at least one country try "you pay low taxes, have very few and hopefully smart labor laws and get absolute safety for anyone at a very low subsistence level". My suspicion is that the safety of "I will never starve, lack shelter, basic healthcare or education for my children" combined with few legal restrictions would lead to an unprecedented enterpreneurial boom. Germany is one of the few European countries to lack a statutory minimum wage. Unions and employers negotiate wages sector by sector. In ten sectors agreed minimums apply to all. But jobs are growing in fragmented services not in manufacturing. Just over half of workers in western Germany are now covered by central agreements; in the east it is only a third. In 2007, 3.7m workers earned under €7 ($9) an hour and 1.2m under €5. http://de.wikipedia.org/wiki/Mindestlohn (use google translate, scroll down until you hit the table listing the various minimum wage provisions - there is no general one, but nearly all work has it's separate agreement somewhere between 7 and 14 Euro. "the Ultimate End of Social-Democratic Labor Policy"
But Greece and Spain are not especially Social democrat at least for Europe, and Portugal not at all. Italy more. But the way in Europe social democrat country have the strongest economy. Companies make decisions based on value. Make labor more expensive and a company will immediately start looking for alternatives. Technology, automation, and outsourcing all start to look better when labor is prohibitively expensive (or restrictive). While this makes productivity look better, it is not necessarily healthy for an economy. 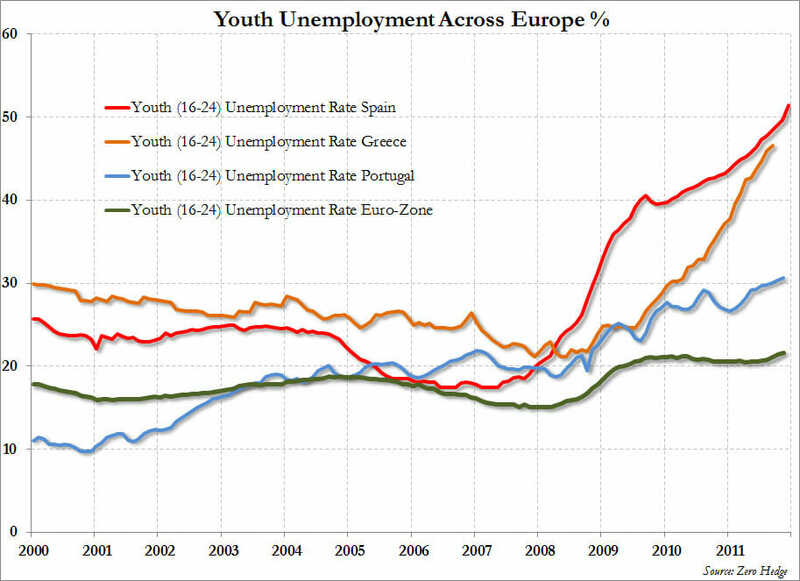 It should be noted that teenage unemployment spiked relative to overall unemployment beginning in mid 2007. As the building boom quit, the minimum wage rose by 41% in three steps over 24 months....you do not need to be Smith or Bastiat to see the connection. Perhaps OT but Ted Rado I have wanted to say for a long time how much I really enjoy your comments. It's great to get sensible and well-articulated views from someone with the trifecta of long life experience, insight, and common sense. I come here of course to get Coyote's take on things, but I think the commenters here are also a big part of the draw. The minimum wage exists to support unions, many of which have wage escalation clauses tied to, what else, the minimum wage. Progressives, Augghh. They are going to kill the golden goose. 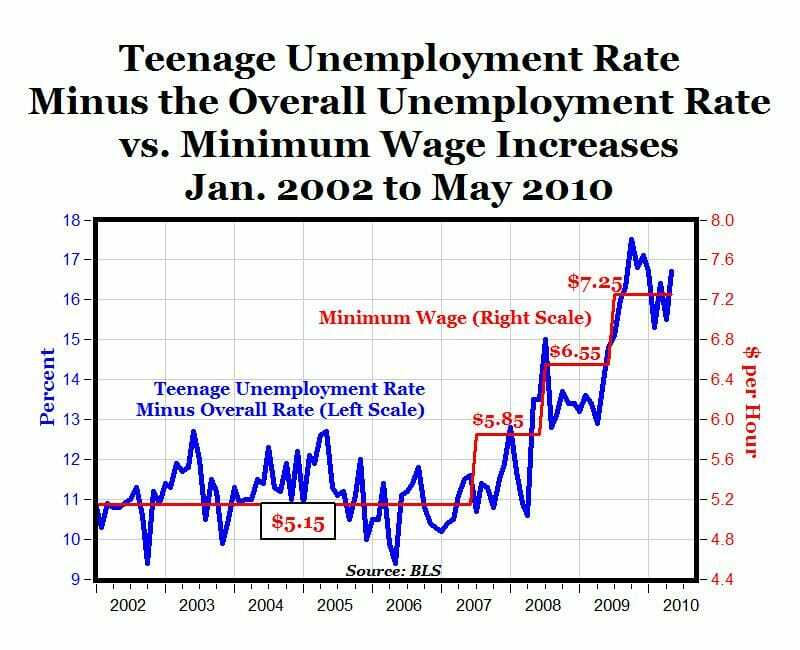 From looking at the graph, I'm not entirely sure that the first minimum wage hike affected teenage unemployment, it's possible that $5.15 an hour was below marginal productivity and $5.85 was pretty close to it. The second and third jumps very likely pushed wages above the margin. Since raising the minimum wage is a political process, I'd expect to see the unemployment rate rise _before_ the wage increase, what you see happening with the second and third hikes: Congress is debating raising it so companies hold off hiring until they find out what the result is, classic regime uncertainty. You don't really see this with the first wage hike (the variation looks to be within the normal range to my eyeball,) which makes me think even more that the first hike was inframarginal or moved the wage close to the margin. What minimum wage opponents might want to focus on is why the first minimum wage increase raised wages (if it indeed did?) 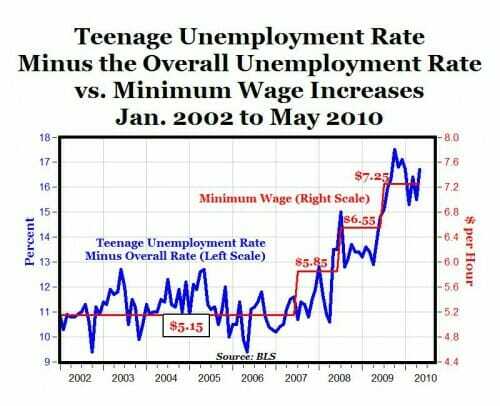 If it did without increasing unemployment, doesn't that imply that the prevailing wage was below the marginal revenue product of teenagers? Shouldn't an efficient market bid wages up to MRP? Or, were companies substituting away from capital and into lower productive but cheap labor, pulling the average unskilled labor wage down? But still, wouldn't raising the minimum wage increase unemployment as these low-productive workers are traded for capital or more productive workers, it still looks like wages were below marginal revenue before the first raise? Can you pull transaction costs or something like "sticky employment levels" to explain a lag between wage increases and unemployment increases. But if that's the case, why don't we see unemployment lag, not lead, the other wage hikes? This might make a good regression discontinuity study for an economist to estimate the actual marginal productivity of teenagers. So, according to your first graph and your story, Greece, Spain and Portugal were removing minimum wages, decreasing taxes, ect. just until 2008, and in 2008, all of them started to reintroduce high minimum wages, taxes, etc.??? The labor market reforms in the 2008-2011 period in these countries were liberal reforms in the sense that they tried to cut back on regulation (e.g. Spain 2010). The main story the graph tells is that regulative features of the labor market explain little or almost nothing of the variation in unemployment, and that unemployment is primarily determined by structural or cyclical factors! *G* Yeah, post hoc ergo propter hoc... you do have to wonder which correlation exists between teenager employment and skirt length. Although I know virtually nothing about the minimum wage in Germany, the table from Wikipedia doesn't list very many occupations; for example, there is no listing for "camp ground attendants" or "retail clerks". As for the "one-third of the average wage in the area and industry", that seems like a very low threshold; it seems like the vast majority of the time a firm would be willing to pay more than one-third of the average wage. For retail clerks in the Seattle area, that would equate to a minimum wage of $4/hour or so. You can't get a babysitter for that wage in Seattle. Germany does have a low youth unemployment rate, and it seems possible their minimum wage policy is a factor. Thanks for your kind words. It is interesting how many things happening today revive memories of past experiences. Bear in mind that to most young people, I am just an old fart with nothing of value to contribute. If you don't believe that, just ask my kids and grandkids!! As with what Hector said, if your narrative's listed factors were the only (or even primary) thing at work here, that first graph would have been climbing all along, rather than spiking in 2008 - you know, when the global "recession" hit. Unpersuasive; you've overstated your case.